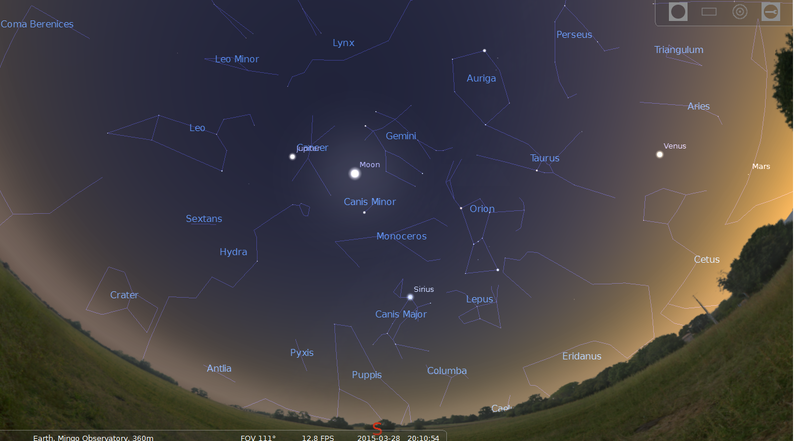 Tonight – March 28, 2015 – the waxing gibbous moon isn’t far from the very bright planet Jupiter on the sky’s dome. If you look carefully, you should also see the Gemini stars Castor and Pollux – noticeable for their brightness and nearness to each other – near the moon and Jupiter. Another bright star, Procyon, is also nearby. Just remember, Jupiter easily outshines all these stars. It’s the brightest object in the moon’s vicinity tonight. The Wagman Observatory Star Party scheduled for Friday, March 27, 2015 is CANCELLED due to conditions. The Amateur Astronomers Association of Pittsburgh is pleased to invite you to the Wagman Observatory and to the Mingo Creek County Park Observatory for 2015 Star Party Season. 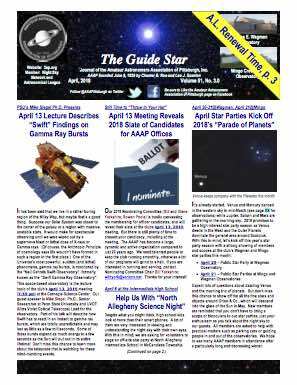 This month’s meeting is 7:30 pm, March 13, 2o15 at Allegheny Observatory. In case of an inclement weather cancellation, it will be reported on the website, in a special Guide Star supplement, on the AAAP listserver and on the club’s Facebook page.